I’m not going on holiday this summer, perhaps later in the year. I make it my aim to proceed with the English version of my Mazeppa book and hope to complete a composition on which I’ve already been working for years: Ondine, a longer work for piano in seven tableaux on the well-known tale of Andersen. Together with a collegue and good friend of mine, the pedagogue and writer of books on interpretation of the Chopin studies and Beethoven sonatas, Jan Marisse Huizing, I visited the famous jazz pianist Rob van Kreeveld for an interview. I have known Rob personally for almost twenty years, because we both taught at the Royal Conservatory in The Hague. Many of my students were jazz pianists who enjoyed their main-subject lessons from Frans Elsen, Rob van Kreeveld or Rob van Bavel, three famous Dutch jazz pianists; I was teaching them technique and classical repertoire. We talked for a good two hours, an interview which will appear in the next Piano Bulletin (2014-3). 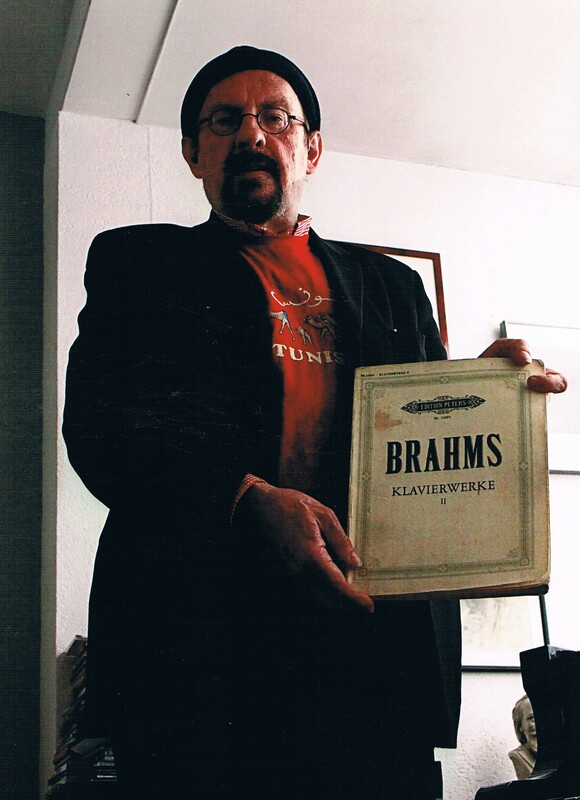 It was known to me that Rob was fond of classical music, but that we discerned on his grand piano a photo on which the jazz pianist is posing with a Peters volume of Brahms pieces in his hands – that I hadn’t expected! The past season I’ve hardly played in public, partly because of the release of the Mazeppa book. But I have not been idle and have studied new repertoire: a programme with unknown works of J.S. Bach, Czerny, Bernard van den Sigtenhorst Meyer, Chopin and myself, which I hope to perform occasionally during the next season. By way of ‘try-out’ I gave on Sunday 6 July a private house concert for some friends and family. Performing in a festive concert on the occasion of the 80th birthday of Coosje de Wit, for many years the treasurer of EPTA-The Netherlands. My contribution consisted of three unknown, but surprisingly beautiful, impressionistic piano pieces of the Hague composer Bernard van den Sigtenhorst-Meyer, taken from his opus 1 (Van de Bloemen), opus 4 (Van de Vogels) and opus 14 (Oude Kasteelen). ‘t Mosterdzaadje, Kerkweg 29, Santpoort-Noord, at 14.00 hours. On 1 June the Finale of the popular Piano Series ‘Koffie bij de Piano’ took place in Theatre ‘De Parade’ in ‘s Hertogenbosch (Den Bosch). As a representative of the Franz Liszt Kring (‘Franz Liszt Circle’) I hold, together with my collegue, the pianist Frederic Voorn, a seat in the press jury. The First Prize and the Prize of the Franz Liszt Kring, consisting of two books by the great Hungarian Liszt scholar Legány and published with the financial support of the Liszt Kring, was assigned to the Ukrainian pianist Anastasia Kozhushko, currently living in Belgium. The Lenie van Roosmalen Prize for the ‘Best Pianist’ was bestowed on Erwin Weerstra, who had previously played twice at house concerts organized by the Liszt Kring. The Belgian Maarten Lingier won the ‘Prijs [Prize] familie Labberté-Hoedemaker’. Afterwards there was a masterclass on the compulsory work, the third Liebestraum by Franz Liszt, given by the renowned pianist Geoffrey Madge. 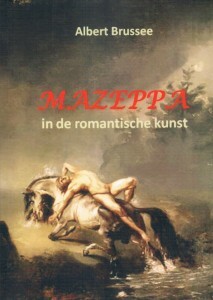 Mazeppa in de romantische kunst – een interdisciplinair cultuurhistorisch onderzoek [‘Mazeppa in the Romantic Art – an interdisciplinary cultural-historical study’] Ivan Mazeppa, while a page at the court of the Polish King Jan II Kazemierz, maintained secret amorous relations with the young wife of an older, high-ranking nobleman, Falibowski. When the lovers were caught red-handed, the apprehended lover was bound naked to a wild horse and driven into the wilderness to die a terrible death. In the 19th century this story was immensely popular and spawned countless poems, dramas, operas, orchestral works, piano pieces and dozens of paintings and engravings. In addition, over a period of more than sixty years the story was also visualized in the form of a hippodrama – a type of performance in which the horse plays the leading role – in circuses and theaters. These performances evolved into some (silent) Mazeppa movies. 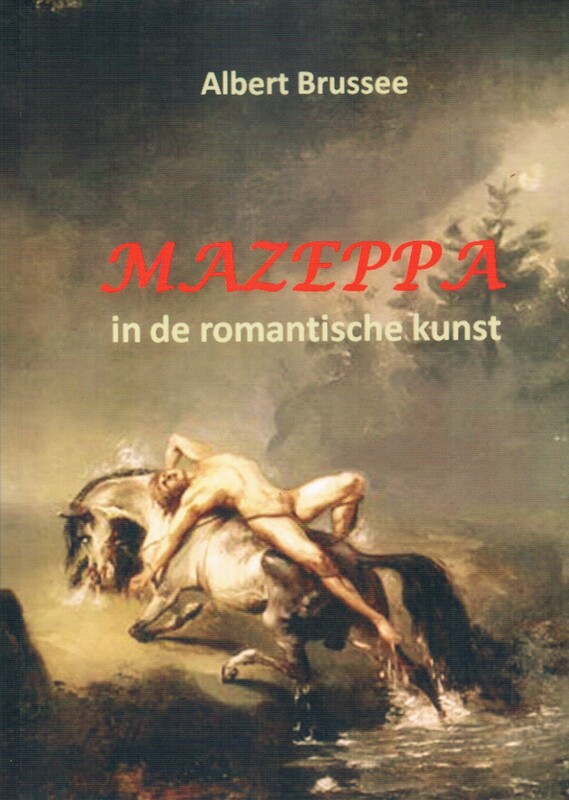 After two introductory chapters on the historical Mazeppa and Romanticism as style, this book provides an overview of the approximately 160 works of art inspired by this subject and reveals the links between all these media. The richly illustrated book (310 pages, 173 illustrations, full colour) is written for the reader who is interested in history, culture, art and music; specialist knowledge is not assumed. More information (a full table of contents and some sample pages) can be found in the main menu > NEW, and at WRITINGS > Books / Brochures > AB II-03. ‘Delaborde in Leipzig – enkele aanvullingen en opmerkingen’ [‘Delaborde in Leipzig – some additions and comments’]. With a response from Christo Lelie. When my book was finished, I decided to take one week of rest. And where can one do that better than on the banks of Lake Como, perhaps the most beautiful place on earth! 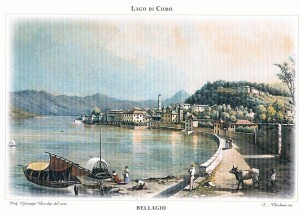 I had my hotel in Como, where Franz Liszt and Marie d’Agoult once stayed in Hotel Angelo at Piazza Cavour (at the harbour). They remained for a longer period in Bellagio, located at the junction of the three arms of Lake Como, famous for its magnificent villas and beautiful gardens. The house in which they lived still exists and – nota bene! – was for sale! Too bad I did not have enough money with me – otherwise I would have bought it and converted it into a Liszt museum…..! The house used to be at the border of the lake, but at the beginning of the 20th century a street and hotels were built in front of it. The old situation is to be seen on the colour postcard below, which I received as a gift from the wife of my hotelier. The yellowish-white house with three windows almost in the centre of the image (to the right of the church and to the left of a small tower) is the house in question. 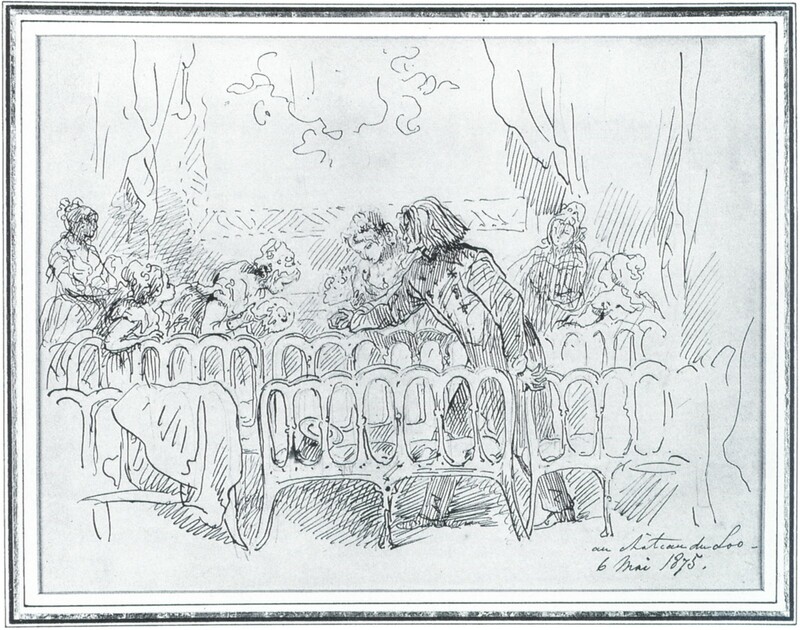 – ‘Franz Liszt und die Amerikanerinnen – een anecdote’ [‘Franz Liszt and the American girls – an anecdote’]. – ‘Franz Liszts tweede reis naar Nederland (van 8 tot 26 juli 1854)’ [‘Franz Liszt’s second journey to the Netherlands (from 8 to 26 July, 1854)’]. In this study, on the basis of letters addressed to Carolyne von Sayn-Wittgenstein, the sixty-hour journey from Weimar to Rotterdam on the Rhine – on a paddle steamer of the Dutch Steamship Company! – and Liszt’s presence at the festival to mark the 25th anniversary of the Maatschappij tot Bevordering der Toonkunst [Society for the Promotion of Music] is dealt with at length. Special attention is given to a trip to Scheveningen and The Hague, where the composer had contact with Ary Scheffer and Prince Hendrik of the Netherlands and his wife Amalia at Palace Kneuterdijk. 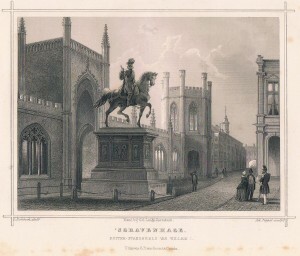 The illustration shows the equestrian statue of William the Silent, erected in front of the Galerie Gothique in The Hague, which Prince Hendrik proudly showed his guest. A lithograph by L. Rohbock and Joh. Poppel; author’s collection. – ‘Franz Liszt, Olivier Messiaen en de Heilige Maagd Maria’ [‘Franz Liszt, Olivier Messiaen and the Holy Virgin Mary’]. In this article two compositions are compared: Liszt’s Angelus! Prière aux anges gardiens from the third book of Années de pèlerinage and Première communion de la Vierge from the cycle Vingt regards sur l’Enfant Jésus by Messiaen. It appears that there are many similarities, both in terms of subject, structure and in the metric and harmonic sense. – Valse chopinesque (Second, Revised Edition); for more information see: SHEET MUSIC > Personal Compositions > AB II-17. – Zdenek Fibich, Poème; arrangement for concert use; for more information see: SHEET MUSIC > Co-productions/Arrangements > AB II-21. – Leonard Bernstein, MARIA from the musical West Side Story; freely arranged for piano; for more information see: SHEET MUSIC > Co-productions/Arrangements > AB II-20. – ‘Franz Liszt at Het Loo Palace of King William III of the Netherlands’. Franz Liszt was five times in the Netherlands for a longer period. Especially concerning his stay at Het Loo Palace near Apeldoorn virtually nothing is mentioned in the international Franz Liszt literature. This study fills this gap to some extent. Below one can see how Liszt is teaching the so-called ‘pensionnaires’ (students auditioning for a scholarship) in the palace’s theatre. 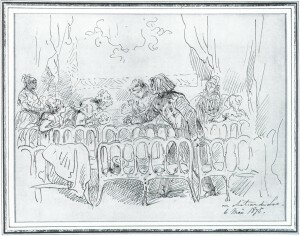 A completely unknown drawing by Charles Rochussen, Staatsmuseum Paleis Het Loo [State Museum Het Loo] collection, Inv. Nr. T79. – Liszt et la France (book review).